This very well attended visit was organised by Howard Day, resident of the parish. His cousin Paul was also present, both Talbot owners. A gathering of about a dozen Talboteers assembled at the Premier Inn, opposite the car plant, for a light snack on a glorious sunny day, which made a change from the miserable weather hitherto. Sadly, no Talbot cars were in evidence, but there were the usual exchanges of ‘whose car is in dock ‘and some car boot exchanges of essential parts to keep cars on the road. After a quick lunch we assembled at the Mini Visitor Centre for our briefing and kitting out with high-viz and radio receptors. Our guide, Terry, worked at the Leyland plant for 50 years and now volunteers to take parties around those parts of the plant which are safe to visit. We were taken by bus to the body shop which cost £750m to create. It has 2,000 robots and produces 60 complete bodies an hour from a vast number of pressed steel elements which go to make up the shell, including the doors and bonnets. There are very few employees in the body shop as virtually the whole process is automated. As each additional section is spot-welded by the robots using fusion welds, the robots pass the workpiece onto the next section and so on. Employees make sure that there is enough work material for the robots to pick. As we were taken through the site we could see the components taking form until the whole bodyshell was visible. 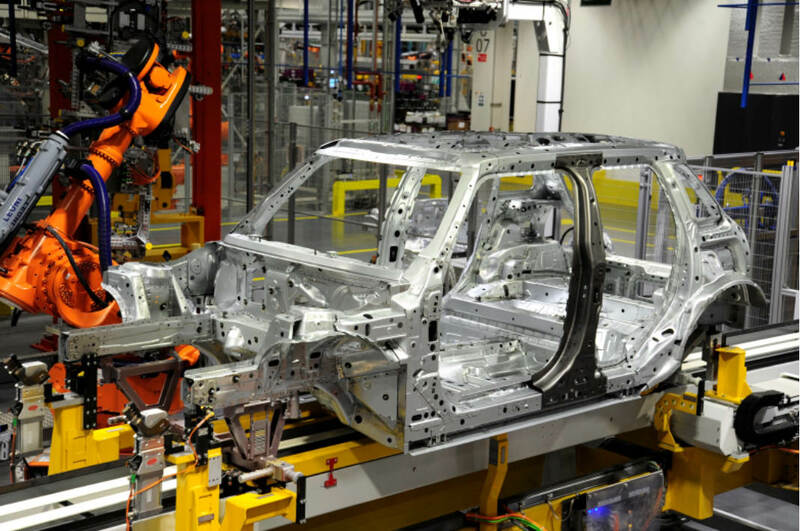 The robots at the later stages are more robust to take the weight of the bodyshell which has 6,000 welds by the time it passes to the paintshop where it is acid dipped and re-galvanised to prevent rusting around the weld spots which breach the galvanisation. We did not see the paintshop, but progressed to assembly. Each car made is pre-ordered to the customer’s own specification and all body types and colours are built on the single assembly line in no particular order, which means that the logistics of making available the correct engine, gearbox, trim, wheels etc. to the line to pre-painted body shells must be a science in its own right. Truly amazing! The employees work in teams of twelve and are on a moving track with the cars on a monorail system which can rotate the car as needed for certain stages of the build. The assembly involves around 3,000 components. At the end of the line, the cars are driven and put onto two trains a day for shipping abroad as 70% of the production goes to overseas markets, most of which are left hand drive vehicles. The production rate is 57 cars per hour in three shifts. BMW have invested enormous amount of money at the Cowley works and show how to make cars in a modern, largely automated, plant. Hats off to them. One wonders what Red Robbo would have made of it! When BMW sold off the Rover Group in 2000, they retained the Cowley plant and transferred the production line for the new Mini from Longbridge, Birmingham, to Oxford. The current Mini plant is on the site of the old Press Steel factory established in 1926. The main production sites of the old Morris factory (North and South works) were opposite the current Mini factory and demolished in the 1990’s. This latter area has now been redeveloped as business and retail parks. At its peak in the early 1970’s, the old British Leyland plant directly employed over 20,000 employees. Now just 4,000 staff are employed, the major change being through automation - in the body assembly section, for example, over 3,000 staff have been replaced by 1,200 robots and fifty technicians. Since 2015, the Mini plant at Oxford has produced the 3 and 5 door hatchbacks and the 6 door Countryman estate, is responsible for body shell production, painting and final assembly. Approximately 250,000 cars a year are produced at the factory. Convertibles and larger Clubman models are now made in Holland. The Oxford plant receives body parts and sub-assemblies from the Swindon pressings plant and engines from the Ham Hall engine facility. Other components are sourced from across Europe – for example wiring harnesses from Romania - all delivered on a ‘just in time’ basis. All components are bar-coded and each car is fitted with a transponder at the start of the assembly process. The transponder contains all the customer order specifications. Throughout the assembly process, robots and computers match the components to the build specification held within the transponder. With the huge range of engine, body and trim options available, it is claimed no two Minis are the same – much like a Talbot – perhaps things have not changed so much after all.